My buddy posted this as a follow up to a tired thread but it is worth its own life. The "mom' he refers to was unbelievable. What a horrible experience she had! But Jon made the best of it! I was there in Tampa with Fred and b, and can confirm b did not live up to the pregame hype, but that he did really enjoy himself. The real audience participation story (or lack of participation) was a mom from outer suburbia. In tow with a husband and two children (the husband obviously drug her there), she occupied a seat in row two, the middle section. During the show (towards the end) Jon A. motioned to her to stand up with the crowd (on more than one occasion), very good naturedly, which she was oblivious to. The only person in Tampa who will be having a worst time than she did at the show will be her husband, as we were sure that he will be hearing about it for the rest of his natural born life (which if he's lucky will end this weekend). I thought Alan Parson stole the show. The mix sounded crisper to me. 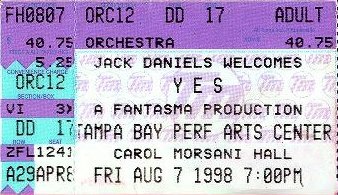 As much as I enjoyed Yes (and it was a classic show) I left hoping I'd get another opportunity to see Alan soon, and for 2 hours instead of one. Bloody marvelous time last night. Let me start by saying, that like many others, I was impressed with the APP. They are good musicians, and I would be interested in hearing more of their work...never having been a fan. On to Yes: Simply amazing. The Performing Arts Center was the perfect venue to see them, and my friend and I had seats dead center, about 40 feet from the front of the stage, the sound was superb. Highlights were...the guys clowning around during the numbers, Steve Howe, AYAI, HOTS, Chris Squire, the lighting effects, and of course CLOSE TO THE EDGE! They just nailed CTTE. So glad they played that one. I noticed Jon had to look at the setlist on the floor to intro OYE. Really makes me wish they had played stuff on the Keys albums. The band had great energy as did the crowd, and I hope they come back to that venue next time around. One final note...Igor was good, agreed he was mixed low, but since he was not Rick...he didn't come to the front like Steve, Jon, Alan, or Chris, and so it's like...well I heard keys...but not great big huge keys like I would desire...ah well...still good though. Enjoy the West Palm Beach show South Florida!